Appeal and revision are legal terms used in court. Though they seem similar they have certain differences; they represent two different types of applications that an individual can opt for after unsuccessful court hearing. The introduction of appeal and revision in court has helped many individuals receive a fair hearing. Through an appeal the case is heard again by a different court, this may lead to a new decision. In a revision, a high court checks whether legal actions were followed and that the court exercised regular jurisdiction. The unsuccessful party is supposed to file an appeal in the given time limit which begins when a lower court makes a final decision. Without the filing or late filing the appeal process is unsuccessful. The court determines whether to have a revision of a case or not. It is not a right of the party to have one. The high court only considers revision if it suspects some illegalities and non-exercise of jurisdiction. The process of revision involves rewriting and reworking which no time limit hence can be filed at any reasonable time. An appeal is whereby an individual petition for the case to be heard in a new court. In most cases, the case is heard on a higher court from the previous one. In simpler terms, an unsuccessful party in a case decides to take the case to a higher court to seek for reversal of a decision made by a lower court. The party that files an appeal believes that there were errors made either on the laws or facts raised. The agenda of the higher court going to rehear the case which is commonly known as the appellate court is to review the decision previously made by another court by focusing on the legal issues and reasons that led to the decision. The party that files the appeal is known as the appellant and has the statutory right to an appeal. The appellant is required to register for an appeal with the supporting documents in the given time limit by statute for it to be successful. Revision is the re-examination of legal actions. They may be some assumptions made illegally, non-exercise or exercise of jurisdiction irregularly by a lower court. In this case,, therefore, a higher court reexamines the decisions made by a lower court to know whether all the legal actions were exercised. Unlike the appeal, revision is not a statutory right. The superior court therefore can decide to examine or not examine a decision made by a lower court. The main primary purpose of a revision is to make sure that justice has been administered properly and also to correct any errors that could have led to improper justice. If the higher court finds that the legal procedures were followed to arrive at a decision, then no changes are made no matter how unreasonable the decision may appear. Revision is basically reworking and rewriting. The appeal is a constitutional right for an unsuccessful party in the court. Revision on the other hand is discretion of the court, meaning it can take place or not. The appeal is a court hearing like any other while revision is not necessarily heard in the court. According to the Civil Procedure Code, a request is handled by a superior court to the previous court so it must not be a high court. A high court can only revise. In appeals, the courts have the power to interfere in any way but in revision the influence of intervention is limited. There is only one procedure involved in an appeal that is the hearing of the case. In revision, however, two methods are included, preliminary and final. An appeal is a continuation of the court proceeding on a certain case while a revision is checking whether the legal actions were followed in the proceedings. An appeal examines law basics and facts on the other hand revision entails examination of legal actions, jurisdiction and procedure followed to arrive at a decision. In an appeal a party is given a certain time limit to have filed an appeal which begins immediately a final decision is made by a lower court. In revision there is no time limit, a party can file for it any time though the time must be reasonable. For an appeal to be successful the party involved must file for the appeal but in the case of revision filing is not a necessary act. The terms appeal and revision are both legal terms used in court. 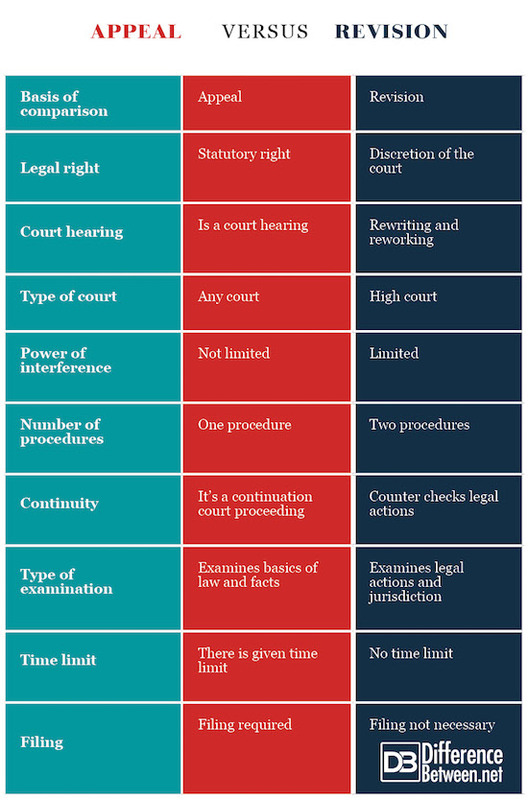 Though the terms seem similar, they are used to mean different processes in court. 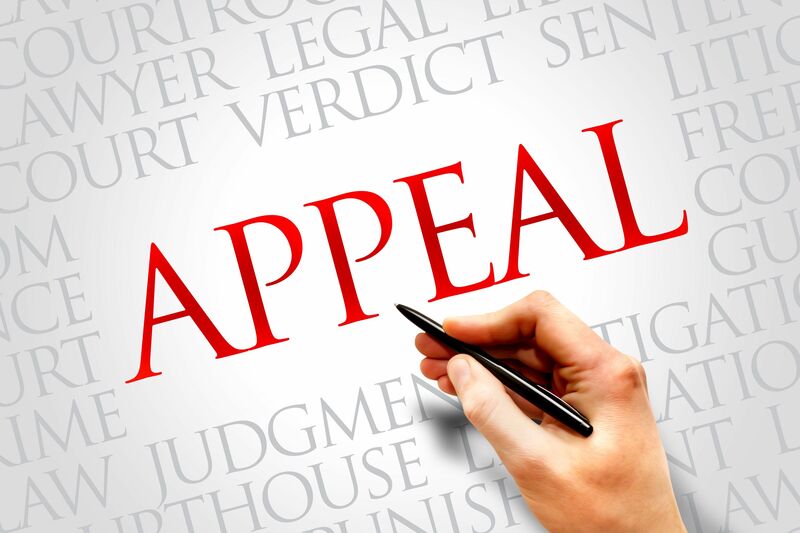 An appeal is whereby the case is heard again due to the dissatisfaction of a certain party while a revision is done by a high court to ensure that legal actions were followed in arriving at a decision. Only the high court can do a revision. An appeal is a statutory right. Both appeal and revision can help in making corrections of a previous hearing. Evah Kungu. "Difference Between Appeal and Revision." DifferenceBetween.net. July 23, 2018 < http://www.differencebetween.net/miscellaneous/legal-miscellaneous/difference-between-appeal-and-revision/ >. State of Kerala v. K.M. Charia Abdullah & Co., (1965). 1 SCR 601, 604 : AIR 1965 SC 1585. K Subbarao.